Updated Wednesday April 17, 2019 by Sara Montgomery. West Mountain Racing invites you to join the team! Programs offered include: Alpine Racing Team, and Intro to Racing! WMR's Alpine and Freeski and Snowboard Programs train on-snow beginning weekends in November at Whiteface until West opens in December and training continues until March/April. Off-season camps, Summer and fall fitness opportunities are also offered. Team details are listed here! Please make sure to read all the WMR Program documents before registering for the WMR programs and email sara@westmtn.net with any questions. Pricing and additional program information on menu to the left. West Mountain Racing (Alpine) -- Academy-like training (5-6 days of training a week), travel and race tuning at reasonable rates. WMR welcomes FIS, USSA and HS Ski Team athletes to join our program. Rates and privledges apply to all members. We also offer our Intro to Race 6-week program for those interested in learning the basics of racing. For pricing and to find your athlete's U level, click here. We have a no refund policy. West Mountain Race Team Full Membership is a competitive race program that travels (travel commitment varies per age group). Membership to the WMR Race Team includes a race team coat, (only guaranteed if registered by Early Bird cut-off date), a Full Privilege Race Season Pass, locker space in our Race Building, Christmas and February Break camps and Dryland Training in the summer and fall! WMR U10s-U19s train Tuesdays-Thursdays from 6-8 pm. Saturdays and Sundays 8:30am-3:30pm. WMR Core/FIS athletes train Tuesdays-Thursday from 3:30-5:30pm (as a group) and Saturdays and Sundays from 8:30am-3:30pm (with the rest of the team). Summer/Fall Dry land training (schedule can be found on this site) : Includes hiking, biking, and other calisthenic exercises and activities. Fridays we welcome all age groups to meet up with their WMR friends to freeski. Private coaching is also available with our coaching staff to WMR members (by reservation only and separate fees apply). West Mountain Racing's Midweek ONLY Membership includes Midweek Training Only, a Midweek Race Season Pass, Christmas and February Break midweek camp, and fall dryland training. Summer/Fall Dry Land Training (schedule can be found on this site) Includes hiking, biking, and other calisthenic exercises and activities. West Mountain Racing's Weekend Only Membership (open to out of area athletes) includes Weekend Training Only (8:30am-3:30pm), a Weekend Only Race Pass, and December and February Break Week Camps. If they race under WMR they qualify for a team coat! Must Purchase a Full Program Membership before registering for Core. The Core Program is customized for each U14, U16, U19 and FIS advanced racer who is also registered as a West Mountain Race Team Full Member. These athletes are looking to advance to post season competition and beyond. WMR reserves the right to limit participation. Core meets Tuesday-Thursday from 3:30-5:30pm. They can also do a double session and train with the team from 6 -8 pm if desired on those days. Core athletes also can train with the team Saturdays and Sundays from 8:30 am-3:30pm. Homework space is available in our Race Building. Intro To Racing Program is a fun, non-competitive, non-travel ski race program for ALL MOUNTAIN SKIERS (ages 6-14) who are ready to be challenged by all types of terrain and snow conditions. They must be able to ski all terrain also be able to ride the lift alone. The program begins Saturday, January 9, 2020 and meets on Tuesdays from 6-8 pm and Saturdays from 9am-2pm and runs for 6 consecutive weeks. Registrants are also invited to participate in WMR's Mini Cup Fun Race on Thursday during February Break Week. Race coaches will help your child develop the proper fundamental movements, skills and race tactics, and will introduce the students to gate training in a fun learning environment. This program meets on Tuesdays from 6pm-8pm and on Saturdays 9am-2pm and includes a 6- week program pass that is valid Tuesdays from 6-9 pm and Saturdays from 9am-4pm during the program. Program passes will be collected on the last day of the program. The program does not include lunch on Saturdays. Intro kids can participate in all the fun races at West with West Mountain Racing. If your child has a season pass, please email sara@westmtn.net to register for the program. The price is $400 for Non-Full Season Pass Holders and $375 for Full Season Pass Holders. *******WMR Code of Conduct--All athletes must adhere to WMR's Code of Conduct. Athletes who do not follow the Code may be removed from training, travel or possibly the team. If an athlete is removed from the team for a major Code of Conduct violation, a refund will not be given. 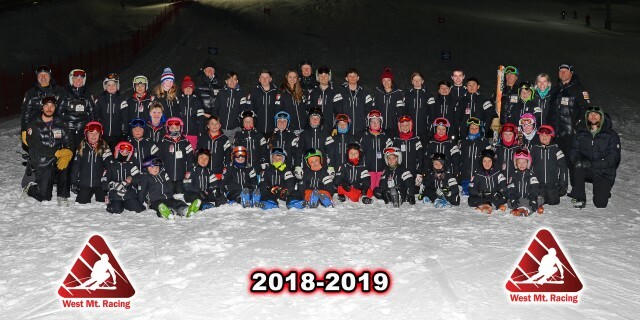 ********Volunteer Service -- All WMR alpine and freeski and snowboard program families are required to work two WMR events per family during the season. For the 2019/2020 season, We will require a payment of $200 at the beginning of the season if you do not want to volunteer. If families do not volunteer for two races during the season, we will issue a payment for $200 at the end of the season. If a parent would like to serve on our race crew (10 or more races), you receive a full season pass. Please email sara@westmtn.net if you are interested in race crew. Travel, coaching and support for USSA and USASA post-season travel must be provided by the parent at a rate per coach of $116 per day, $.55 per mile, cost of coaches’ hotel room and $20 per diem food allowance and arranged through and with the coach. Race Building -Full Members are provided space in the race building to store a backpack during the season in the Race Building. The race building is for full member athletes only as space in the building is limited due to the growing number of athletes in the program. Team Uniform--Full Members of WMR are provided a team jacket, if registered before April 30th, as part of their program fees, which are sponsored by Whiteman Chevrolet and other businesses. The team jackets are to be worn during training, competition and on the podium, This gives our sponsors as well as our team great brand exposure. WMR members receive discounted race tune punch cards at West Mountain Sports. Stop in to purchase yours today!